John Frederick Peart, a soft-spoken and humble Canadian native who moved to Delray Beach in the late 1960s and became a champion and protector of Florida's fragile shoreline, dunes and the turtles that nested there, died July 1. He was 75. Mr. Peart founded Universal Beach Services in 1973. 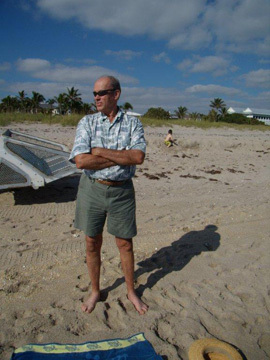 He won contracts to clean beaches from the Panhandle to the Florida Keys, as well as contracting with many Palm Beach County cities and private beachfront homeowners. A man of few words, he became animated whenever the topic around the table turned to beach preservation and dune restoration. During his nearly 40 years in business, he moved hundreds of thousands of cubic yards of sand to restore dune lines and protect property on the shore, yet always mindful of the endangered turtles that nested there each season. He reconstructed a beach in the Florida Keys that had been decimated by a hurricane, using only the resources available at the site. Mr. Peart, a sun-bronzed man with strong, calloused hands, was an entrepreneur and a tireless worker. He designed and built all of his own equipment. His son, Clayton Peart, who manages the business, has been involved in the operations for the last 10 years. "I've learned a lot from him and one of the things I learned was that he didn't get complacent but always looked for new ideas and approaches." In 1977, Mr. Peart became Delray Beach's first turtle monitor. On the eve of a massive beach renourishment program, Mr. Peart carefully dug up and transferred thousands of leathery, ping-pong-ball-sized turtle eggs to new homes so they would not get crushed under the tons of sand that were going to be pumped onshore. Newspaper articles at the time dubbed him the "midwife" of the endangered sea turtles. As a young man, Mr. Peart studied aerospace engineering at Georgia Tech in Atlanta for two years before moving to the Bahamas, where he bartended and worked for engineering companies so he could spend time free diving, which was what he loved most. After several years, he returned to Canada to get his bachelor's degree in anthropology from the University of Saskatchewan. He eventually came back to South Florida and settled in Delray Beach. One of his Canadian childhood friends, Ken Willoughby, remarked that it was fitting he died on Canada Day, July 1, the date in 1867 when Canada became a self-governing dominion of England. As much as Mr. Peart loved Florida, the Bahamas, the ocean and the beaches here, his Cana-dian heritage was always close to his heart. He is survived by wife, JoAnn Kern Peart; sons Curtis (Joanne) Peart of Atlanta; Clayton Peart of Delray Beach; daughter Ann Margo Peart of Delray Beach; daughter-in-law Esther Peart of Miami; brother Tom (Margaret) Peart of Penticton, British Columbia; five grandchildren and several nieces and nephews. He was preceded in death by son Sean Peart, father John William Peart, mother Ruth Brown Peart, and sister Olive Peart Beveridge. A memorial service was held at Trinity Lutheran Church in Delray Beach on July 7. The family asks that in his memory, donations may be made to the Sandoway House Nature Center, the Delray Beach Preservation Trust and Trinity Lutheran Church. ©2013 Universal Beach Services Corp.